Examines the controversial military program based on Tesla technology - its' possible effects on weather and use in mind control. 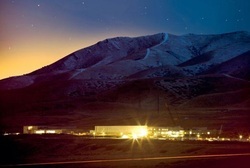 Based on advances in technology created by Nikola Tesla over a century ago, HAARP - High Frequency Active Auroral Research Project - is a controversial high frequency radio transmitter operated by the US military beaming high level energy into the Earth's upper atmosphere. Ostensibly for ionospheric research, HAARP also locates hidden oil reserves and missile silos around the world. However, critics of HAARP say this technology could blow a massive hole in the upper atmosphere as well as disrupt the subtle magnetic energies of all life on Earth. 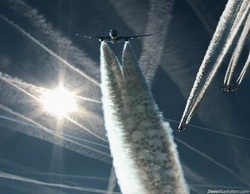 Chemtrail spraying has now been acknowledged by the U.S. Air Force and the FAA, and was proposed to be banned in Senate Resolution HR 2977, sponsored by Congressman Kucinich, where it is named as an "exotic atmospheric weapons system." Later versions of the bill had references to chemtrails deleted. The coverup continues. From Global Cooling To Global Cooling! Back in the 1970s, Time magazine and other major media outlets published a series of articles about the coming ice age. For those of you who have forgotten, or are too young to have experienced this environmental fear campaign, I kid you not. On June 24, 1974, they published an article titled, "Science, Another Ice Age?" By 1977, it was a done deal, as indicated by their cover story, "How to Survive the Coming Ice Age," illustrated here. This is found on the www.usgs.gov website under kids information and Q & A. How do changes in climate and land use relate?The link between land use and the climate is complex. First, land cover, as shaped by land use practices, affects the global concentration of greenhouse gases. Second, while land use change is an important driver of climate change, a changing climate can lead to changes in land use and land cover. For example, farmers may shift from their customary crops to crops that will have higher economic return under changing climatic conditions -- and higher temperatures affect mountain snowpack and vegetation cover as well as water needed for irrigation. How do we know the climate is changing?We are certain that the Earth's climate is changing because of the trends that we see in the instrumented climate record and the changes that have been observed in physical and biological systems. The instrumental record of climate change is derived from thousands of temperature and precipitation recording stations around the world. We have very high confidence in these records as a whole. The evidence of a warming trend over the past century is unequivocal. Many types of instrumental records point to a climate warming trend. Our stream flow records show an earlier peak in spring runoff; borehole temperature records in Alaskan permafrost as well as water temperature records on land and sea show the warming trend. The physical and biological changes that confirm climate warming include the rate of retreat in glaciers around the world, the intensification of rainfall events, changes in the timing of the leafing out of plants and the arrival of spring migrant birds, and the shifting of the range of some species. What would happen if the temperature in the world rose enough to melt all the snow and ice at the North and South Poles? No one knows for sure what would happen if the snow and ice in the polar regions all melted. Sea level would rise, which would flood coastal regions. Climate would be affected worldwide. Isostatic rebound would occur where ice masses were removed from continents, causing the land surface there to rise. Many scientists are trying to predict the effects of climate changes such as a general warming trend by using computer climate models. Much more research needs to be done before we can confidently predict results. Why is studying land use change important?Land use change is perhaps the most observable of all environmental changes. Because land use change is connected to a wide range of societal and environmental processes, a robust body of land use change research helps us understand an extensive variety of interdependent systems, including economic activity, homeland security and natural resource management.